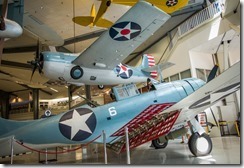 If there is a long forgotten annex that has preserved World War II combat veterans for eventual display at the National Museum of Naval Aviation, it is Lake Michigan. Without the inevitable accidents that occur when new naval aviators are learning to land on an aircraft carrier, we would not now be able to look upon the world’s sole surviving SB2U Vindicator torpedo bomber. 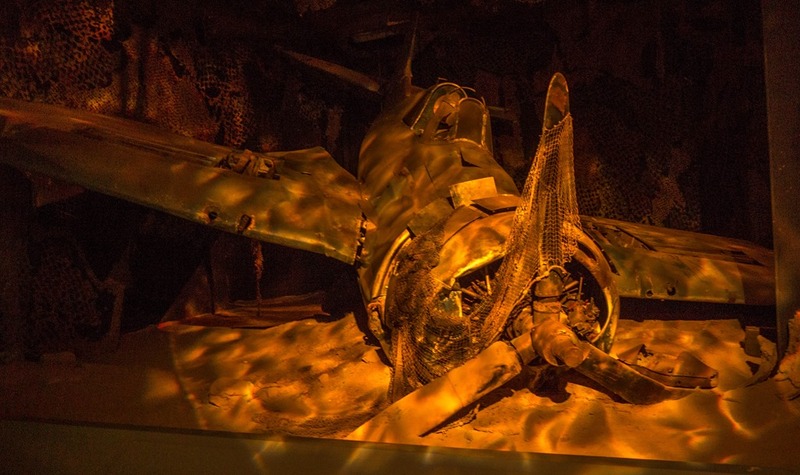 We could not caress the dive brakes of an SBD-2 Dauntless dive bomber that witnessed the attach on Pearl Harbor, and fought in the battle of Midway. Nor could we gaze at an F4F-3 Wildcat that started its service in September 1941 with Fighting Squadron 5 aboard the USS Yorktown. They all ended their active service with the Carrier Qualification Training Unit (CQTU) at NAS Glenview, north of Chicago, Illinois. Looking at them today, imbued with the national worship of veterans, some might be critical of the decisions that led to these veterans of the greatest generation spending four of five decades in the depths of Lake Michigan. But the decision-makers of the time were not so constrained. They had a war to fight and win, and that pragmatism overruled all other considerations. And those who appreciate history should thank them for it. Facing the carrier qualification for thousands of naval aviators and the vulnerability of the ships providing such training in the Pacific, Atlantic, or Gulf of Mexico, training in Lake Michigan seemed the most logical solution. So the Navy put flat tops on two lake steamers and called the result the training carriers Wolverine (IX-64) and Sable (IC-81). Focused on the goal at hand, the Navy certainly expected and planned for training accidents. Probably no one looked to the future and appreciated that, unlike salt water, fresh water does not eat airplanes. It preserves them. 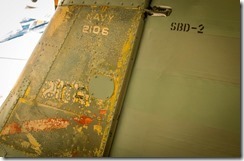 How well is clear on the unrestored patch of painted aluminum on the vertical fin of SBD Dauntless, BuNo 2106. Assigned to the aircraft pool at Ford Island, it survived the attack on Pearl Harbor on December 7, 1941. Then it flew with Bombing Squadron 2 (VB-2) from the USS Lexington (CV-2), taking part in raids on Lae and Salamaua, New Guinea. Then it transferred to the US Marine Corps Scout Bombing Squadron 241 (VMSB-241). 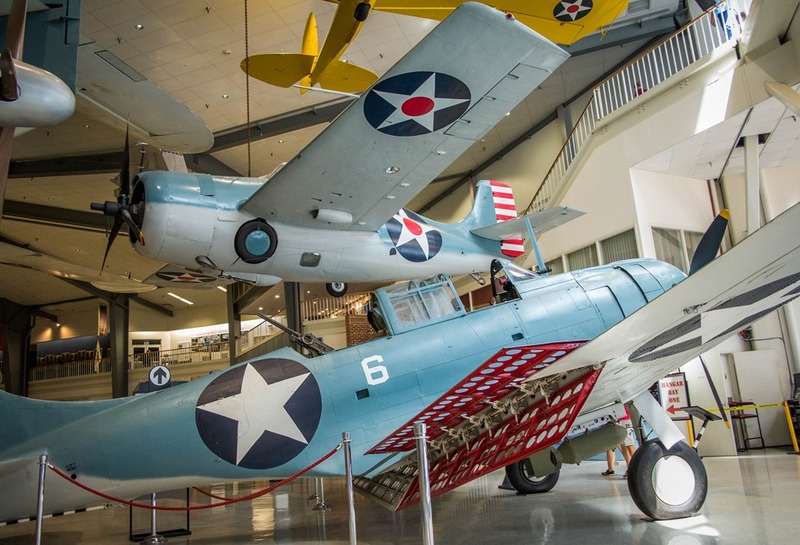 On June 4, 1942, pilot 1st Lt. Daniel Iverson Jr. and radioman-gunner PFC Wallace J. Reid, took off with the other members of VMSB-241 to attack the Japanese carrier Hiryu. 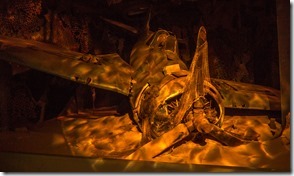 BuNo 2106 was one of the few survivors. 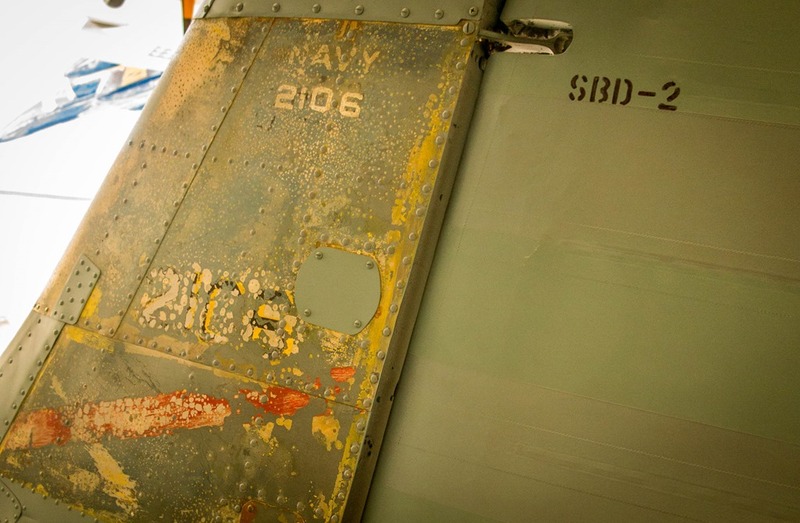 It returned to Midway with roughly 250 bullet holes in it, a wounded crew, and one working main landing gear. Iverson received the Navy Cross, Reid received the Distinguished Flying Cross, and 2106 got a total overhaul before being assigned to the carrier qualification training unit, freeing up newer aircraft for frontline combat duty. During a routine carrier qualification flight, on June 11, 1943, a Marine, 2nd Lt. Donald A Douglas Jr., stalled and spun into Lake Michigan, and sank in 170 feet of fresh water. Salvage crews discovered its resting spot in October 1993 and recovered in January 1994 by A&T Recovery for the museum, which restored it. 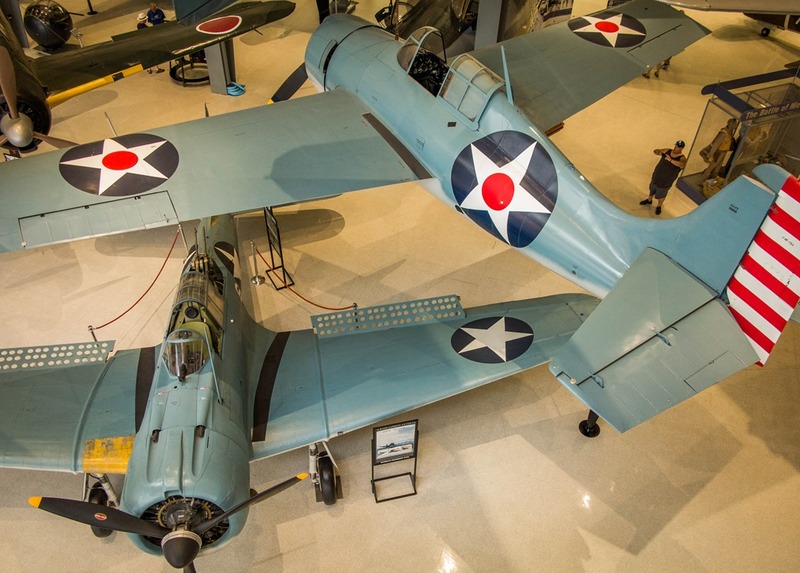 To give visitors an idea of what they started with, the Sunken Treasures exhibit displays an SBD-4 and an F4F-3 Wildcat in pretty much the conditions in which they were found. 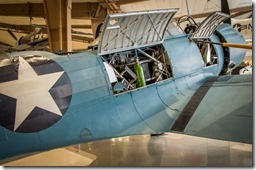 The SB2U Vindicator, a two-crew scout bomber, replaced biplanes in the late 1930s and set the stage for its replacement, Douglas’s SBD Dauntless. 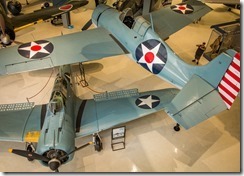 First flown in 1936, the Navy didn’t order very many, just 58 in 1938 and another 58 in 1940. 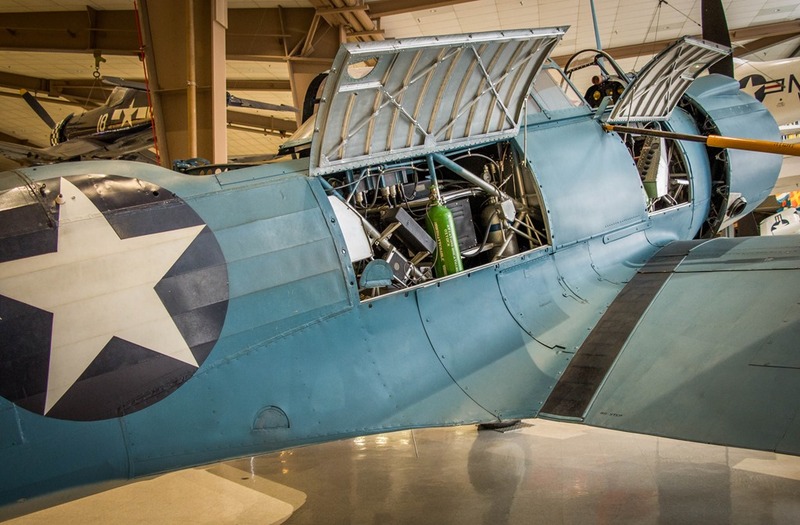 With a trussed fuselage and largely covered with fabric (construction clearly seen thanks to the open fuselage panels), the airplane was obsolete before the war started, but the Marines fought with them at the Battle of Midway and suffered heavy losses. This entry was posted on Monday, October 8th, 2018 at 8:00 am	and is filed under Aviation History, General, History, Military. You can follow any responses to this entry through the RSS 2.0 feed. Both comments and pings are currently closed.